I’ve had three serious boyfriends and I traveled with all of them. One I met on a family trip to Jamaica. We were eyeing each other in JFK and then again, six hours later on a resort in Montego Bay. Another boyfriend and I traveled to ten destinations together. We found our rhythm after a trip to Greece—it was our very first “baecay,” so of course a few hiccups were expected. Then there’s the boyfriend I vowed to never (ever) travel with again. We took a premature getaway to Aruba, and it was miserable. If you really want to test the foundation of your relationship, travel with your boo. 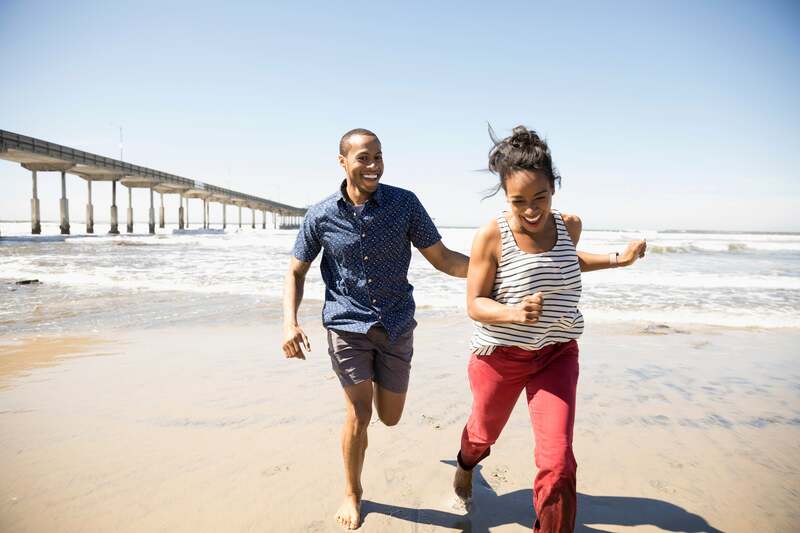 While some say you should wait until you pass the half-year mark, others think travel should be reserved exclusively for committed relationships. I think you’re the best person to determine the status of your situation. If you hang tough, then waking up to your person on vacay shouldn’t be an issue. The biggest problem you may confront is spending too much time together. And if that happens, it’s okay to take breaks. If you’re thinking about taking your first trip with bae, here are a few things to consider. How long have you been dating? Jetting off with your other half too soon can make or break the relationship. I was dating the ex I vowed to never travel with again for five months before we took our first trip together. Things were okay between us. They weren’t great. In retrospect, traveling to Aruba probably wasn’t the best idea but it was on my list, and I didn’t want to explore the island alone, so I invited him (selfish, I know). I caught flights with the two men before him—I just knew we would be fine. I was wrong. We tiffed on the flight there and back, and argued every single day on the island. Experts say, if you’ve been dating for a month, have one night away. Two months, two nights away—or a weekend—and by the time you’ve reached the seven-month mark, you should be ready for a week away together. We were never ready and split shortly after that trip. What is their travel style? My travel style is lucid. I’m pretty much down for whatever. I take calculated risks —the goal is always to see as much of a destination as possible. The ex wasn’t with that. His idea of the perfect vacay was lying around, relaxing on the resort or in the hotel room, binging on Netflix and just chilling. I have very minimal chill. I rest some and explore more. I create a list of the things I want to do and see, restaurants I want to try and beaches I want to snap photos on in all the cute swimsuits I packed. Sitting idly for too long is not my idea of a fun getaway. We had very different travel styles and as a result, we fought. According to a 2016 poll conducted by Holiday Autos, 40 percent of couples bicker at least once a day while on vacay, with a quarter arguing in the first 24 hours. Healthy tiffs are okay but what I experienced with ole boy was not. Have you spent significant time together? I knew the status of our situation before we booked and departed for Aruba. I ignored the signs. The ex and I kicked it when our schedules permitted, but we didn’t spend enough quality time together—we weren’t ready for a baecay. Shorter is safer for a new relationship, but if your gut tells you travel should wait, then wait.